Your adventure starts with a short journey in one of our romantic converted vintage buses to one of our dedicated launch sites. The growing light reveals our teams busy at work preparing your balloon against a backdrop of ancient temples shrouded in mist. There is time for tea, coffee and refreshments before the all important safety briefing. With the balloons now standing upright, it is time to climb on board, where our helpful crew are on hand to assist you into the basket. The balloon is guided by gentle winds not exceeding 15 mph, allowing passengers a serene and peaceful bird’s-eye view of ancient temples drifting by. 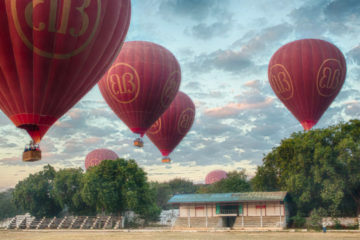 Using his skill and years of local knowledge in Bagan the pilot is able to guide the balloon to a gentle landing where our friendly and experienced crew will be on hand with fruit, fresh pastries and a glass or two of champagne to complete the post flight celebration. There will be a US$20 extra surcharge on 18 Dec 2018 – 10 Jan 2019 (Christmas & New Year Period). 2. Passengers are advised to wear long trousers and long sleeved clothing from 100% natural fibres. 3. Receipt of payment vouchers / flight e-tickets must be produced at launch site. 5. Any known medical condition which may affect your ability to fly or assist the crew must be disclosed to Balloons over Bagan / Balloons over Inle at the time of booking and to the pilot on the day of the flight, i.e. epilepsy, recent surgery etc. Some conditions may preclude you from eligibility to fly. Pregnant women will not be permitted to fly. Balloons over Bagan / Balloons over Inle will not accept liability for illness or injury due to any undisclosed condition or failure to comply with any reasonable instruction given by the pilot or crew or company representative. 6. The pilot in command is legally obliged to consider the safety of his passengers at all times and may refuse to carry passengers for whatever reason if it is considered their carriage may endanger the flight, other passengers or themselves. Balloons over Bagan / Balloons over Inle reserves the right to refuse the carriage of any passenger. 7. Any Passenger in excess of 125 kg / 280 pounds, or any passenger who requires the space in the basket for 2 passengers, will be required to book an additional space at the time of booking and pay a 100% surcharge of the ticket price. Failure to provide accurate information in advance could lead to the refusal of flight at the launch site, whereby no refund will be offered. 8. All passengers must carefully listen to the security briefing (see below) given by the pilot before the launch of the balloon and indicate in case he / she doesn’t understand the security briefing. 9. The pilot of the day has absolute authority and all passengers and crew must comply with his instructions. The pilot’s decision on all matters is final. 10. Balloons over Bagan / Balloons over Inle expects passengers to assist the pilot and crew in any situation that is deemed reasonable, during pre- and post-flight activities. 11. Balloons over Bagan / Balloons over Inle reserves the right to cancel or delay flights, change rendezvous and launch sites, at short notice, to achieve a safe and successful flight. We will not accept liability for any consequential loss or inconvenience. 12. 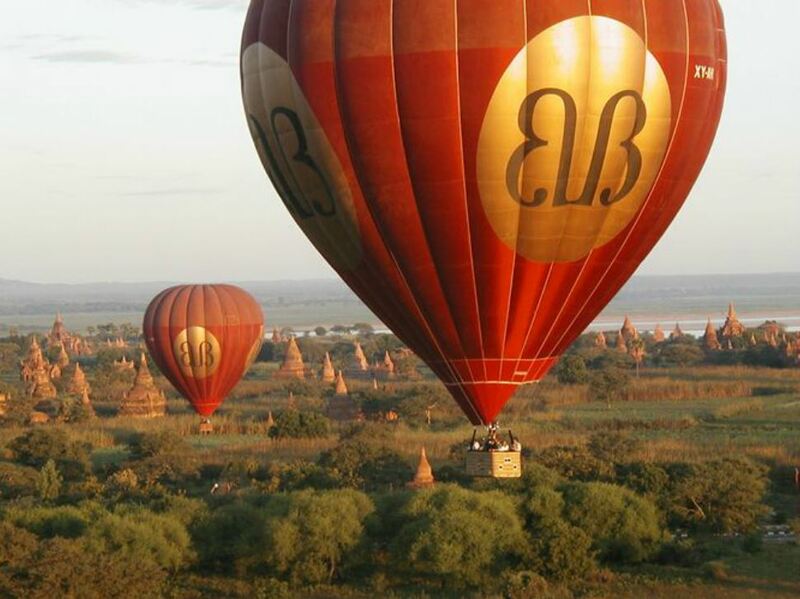 Balloons over Bagan / Balloons over Inle carries third party and passenger liability for each balloon of USD 10 millions. 13. Balloons over Bagan / Balloons over Inle accepts no liability for claims arising as a result of an act or default of any other passenger or bystander. 14. Balloons over Bagan / Balloons over Inle accepts no liability for loss or damage to persons or property other than that which results from negligence on its own part. 15. Balloons over Bagan / Balloons over Inle does not accept liability for loss or damage to personal effects. 16. Flights cancelled by Balloons over Bagan / Balloons over Inle for safety reasons or as a result of unfavourable weather or operational difficulties will be refunded in full. All direct payments to Balloons over Bagan / Balloons over Inle will be refunded in cash either in Bagan or in Yangon. For all bookings made through tour agents, passengers must contact the respective agent to organise their refunds. 17. Balloons over Bagan / Balloons over Inle reserves the right to alter, revise or review any terms, conditions or rates, at its discretion. 18. Balloons over Bagan / Balloons over Inle will not fly children under the age of 8 years. A child under the age of 16 years will only be flown if accompanied by a responsible adult, and the child is over 4’6” tall (or 137 cm). During inflation do not walk between the trucks and the balloon. Stay behind the red barrier cord until asked to “Climb Aboard” by the Ground Crew. To climb in – use the step-holes in the side of the basket. Once you are in the basket do not get out, even after landing – stay in the basket until the Pilot tells you it is safe to get out. Safely stow all phones, cameras, binoculars etc, do not have anything loose around your neck (if you have long hair-please tie it up or tuck it away). When the Pilot gives the command “LANDING POSITIONS” please comply IMMEDIATELY – this is very important for the SAFETY of all of the PASSENGERS. The landing might be a series of bounces and the basket might lay on it’s side and drag along the ground until it stops. Stay in the LANDING POSITION until the Pilot tells you it is safe to move. In the unlikely event of an emergency – please follow the instructions given by the Pilot at all times. Thank you for reading these instructions and enjoy your flight with us.